Does SwiftKey have a spell check? Does SwiftKey have an undo function? Why are random words being capitalized? Can I turn the prediction bar off? SwiftKey Keyboard is all about prediction, and, most importantly, predicting the words that you are going to want to write next (next word prediction). SwiftKey has a 'prediction bar' along the top of the keyboard that offers you three options to choose from. To enter these words into your text field, you can either tap the word on the prediction bar or press the spacebar to insert the middle prediction. Teaching SwiftKey to speak the way you do is easy. If you have used the personalization options to get SwiftKey to learn from your sent SMS, emails, Facebook, etc. then your predictions should be pretty much up to speed already. However, SwiftKey also learns from you as you type, and you can always teach SwiftKey a new word. If you have selected 'Autocorrect' and/or the 'Quick prediction insert' option within SwiftKey Settings > Typing & Autocorrect, then SwiftKey will automatically insert a prediction for you when you tap the spacebar. If you are trying to type a new word that SwiftKey hasn't learned before (and therefore won't predict), all you need to is tap the left hand or middle prediction (depending on text field) which will contain your verbatim text. If you have chosen not to select 'Autocorrect' or 'Auto insert prediction' then pressing spacebar will insert a space for you instead of inserting a prediction. In that case, to enter your verbatim text you simply need to type the word and press space. Is there a spell check in SwiftKey? SwiftKey doesn't offer a dedicated spell check option within the app. However, SwiftKey should offer you correctly spelled predictions based on the word you are typing: for example, if you start typing 'neces' you should be offered predictions such as 'necessary', 'necessarily', or 'necessity'. In this way, SwiftKey does help to insert correctly spelled words. 3 - How do I get rid of a word I don't want? SwiftKey Keyboard for Android doesn't currently offer a dedicated 'undo' button. However, if you realize you have made a mistake, you can press backspace to see the previous selection of predictions. If your desired word is one of the predictions, just tap to replace the incorrect word. You can also tap in the text field to place the cursor. While the cursor is touching any word, you have the option to tap ‘shift’ to cycle through different caps cases, Title Case, ALL CAPS, and lowercase. This will help you fix the word without having to re-type it. Additionally, you can choose to have SwiftKey automatically capitalize the first letter after a period/exclamation mark/question mark by selecting 'Auto capitalize' in SwiftKey Settings > Typing & Autocorrect. 5 - Can I turn the prediction bar off? Predictions are an integral part of the SwiftKey experience, therefore the prediction bar cannot be turned off or hidden. Read more: How do I turn off SwiftKey Auto Insert Predictions? What gestures can I use with SwiftKey Keyboard for Android? If more than one language is in use, you can slide on the spacebar to change layout (e.g. from QWERTY to Greek). Gestures are activated by the speed of the gesture, rather than distance. If you are having problems with your gestures, please try sliding your finger a bit faster across your keyboard. Please note that slide down to minimize, and slide up to capitalize gestures are not available for tablet or large screen devices, but using the back button on your device will still work to minimize the keyboard. While SwiftKey Flow is enabled, all of these gestures are deactivated. Holding down the delete key deletes word-by-word; the longer you hold it, the faster it deletes. How do I hide or minimize the keyboard with SwiftKey Keyboard for Android? SwiftKey does not have a dedicated minimize keyboard button. Instead, if you slide a finger down the keys from top to bottom, SwiftKey is minimized. Alternatively, pressing your phone’s back key will minimize SwiftKey. Please note that if SwiftKey Flow is enabled, you can't slide down the keys to minimize the keyboard. When using SwiftKey Flow, please press the back button on your device to minimize the keyboard. This gesture is not available for tablet or large screen devices, but using the back button on your device will still work to minimize the keyboard. 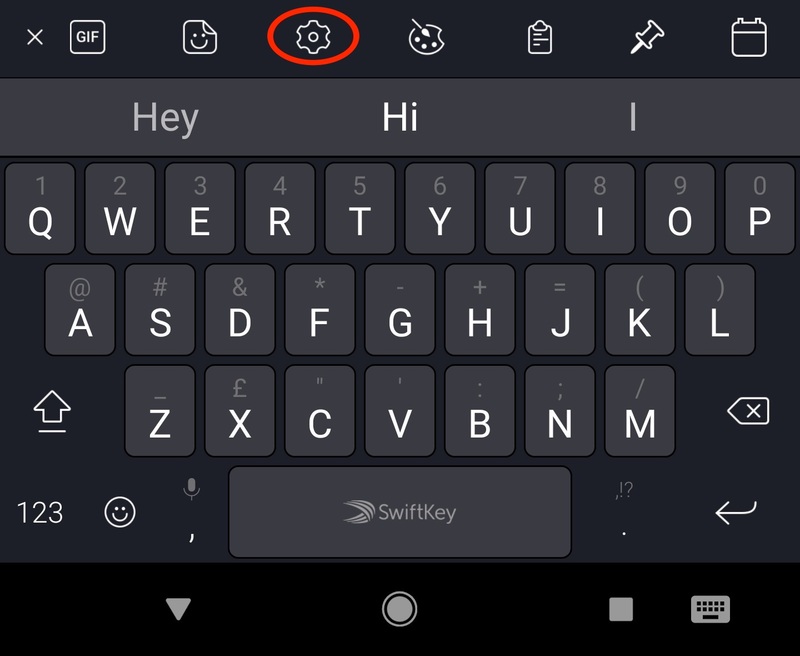 How does the quick punctuation key work in SwiftKey Keyboard for Android? The period key (to the right of the spacebar) allows quick access to the most common punctuation. SwiftKey supports some accessibility features including a high contrast keyboard theme, TalkBack and Explore By Touch optimization. Within the Languages menu in SwiftKey Settings, languages are now displayed in the format "<locale name> / <native name>" and sorted in alphabetical order so that TalkBack will always be able to read the locale name. To type simply slide your finger on the keyboard until you find your desired key and lift your finger off the screen to insert the text/press the button. To enter secondary characters, slide and wait on a key until TalkBack announces 'Alternative characters available’. Then slide over the additional character popup and release your finger to insert. To cancel the additional character selection, release and then slide your finger elsewhere on keyboard. If you'd previously enabled more than one language that uses different language layouts in SwiftKey, then enabling Explore By Touch will change the way you switch between them from the keyboard. Instead of swiping left or right on the spacebar to change language layout, you will need to long press the spacebar to cycle through the different layouts. SwiftKey Flow and gestures such as slide left to delete, or slide down to minimise the keyboard are now disabled. It will not be possible to use the keyboard 'undocked'. If you are currently using SwiftKey undocked, then enabling Explore by Touch will cause your keyboard to be docked. TalkBack is the screen reader by Google that works by giving spoken feedback without looking at the screen. If not already enabled you can turn TalkBack on by navigating to your device Settings > Accessibility. Google provides more information about the feature here. SwiftKey has been configured to work with TalkBack features within the keyboard and keyboard settings area within the app. Navigate to the lower left corner to tap the shift key. Once enabled, you will hear "Caps lock enabled. Navigate to the lower left corner to tap the 123 button below the shift key. Once enabled, you will hear "Symbols and Numbers, showing SwiftKey symbols and number keyboard." Right below the text entry field to the left edge of the keyboard you can expand the SwiftKey settings or menu. Once tapped, you will hear" SwiftKey Keyboard menu. This is also called the Hub. In the lower right corner tap the emoji keyboard. Once selected you will hear "emoji, showing SwiftKey emoji keyboard." To return to the standard layout, tap the abc button in the lower left hand corner. Once you'll hear "showing SwiftKey letters keyboard." SwiftKey is not currently compatible with Android's magnification feature. As a result, tapping the screen 3 times in quick succession will cause the display to zoom in and surround the area in a blue border. Please note this may vary slightly depending on your Android device.